“What’s that sofa doing out there?” one of our volunteer Management Committee members said to a group of regulars sitting outside the pub. “The pub manager said it was fine,” they replied. “Well I think it looks bloody terrible,” pronounced the Committee member. The sofa did look a bit shabby to be honest, but more importantly we’d been having a lot of conversations about how to make the pub more welcoming to everyone in the community. 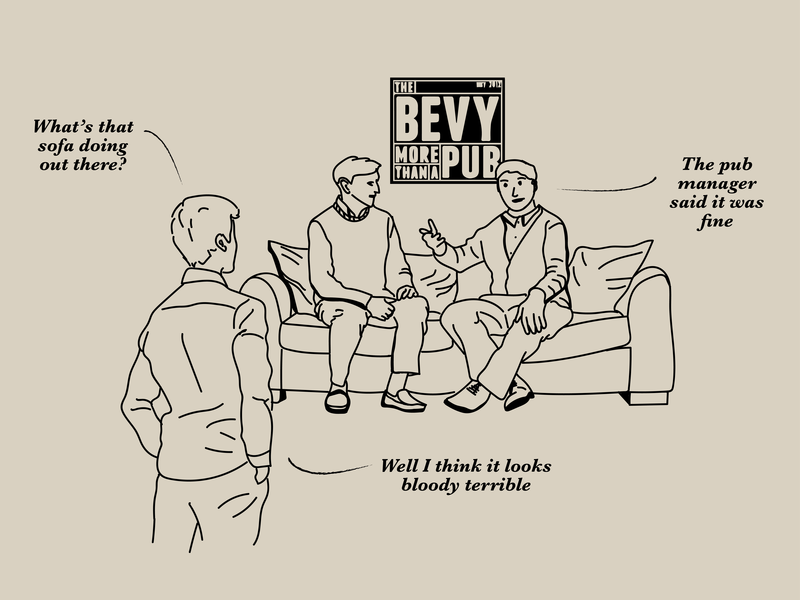 After all, that’s at the very heart of what the Bevy, a co-operative pub on a council estate in Brighton, is all about. The pub was closed down by the police in 2010 for drugs and previous violence so we have always had to work that much harder on things like this. There was a chance having our regulars on the sofa outside could put some people off coming in. That little verbal exchange caused a lot of trouble. Firstly, the manager had told them they could do it. He felt undermined by a Committee member stepping in and the Committee member felt an important issue was being ignored. Secondly, these were regulars – local people who have kept coming to the pub and contribute not only to our bottom line, but also by helping keep some of the issues that got it closed down away from our doors. A few weeks before, a different issue had come up at the Management Committee. In order to protect the pub as a genuinely welcoming community hub we have had to develop and implement a strict barring policy. The policy was working well but when one of our regulars was barred for six months, there were some who didn’t agree that it was the right decision. More than that, they didn’t trust the process by which we’d come to that decision. This made the simple sofa exchange more significant than it might otherwise have been. We ended up having an open meeting between members of the Management Committee, management and our regulars to thrash it all out. It wasn’t an easy conversation but it was an important one. It was clear there was a level of disconnection between the Management Committee, the management and our regulars. What it really came down to was a question of power. Whose pub was this? As a co-operative the Management Committee are in theory appointed by the membership, those that have bought shares in the pub. It should exist to represent them and promote their interests – and in turn appoint a staff team to which it delegates the day to day management. It shouldn’t really have an elevated status – this is the members’ pub, not ours. And on those members, we have 800 shareholders – but are they really the people that have a sense of ownership of the place and to whom we want to be held accountable? As a committee are we sharing enough of the processes and decisions with our members? And whilst we hold fast to a rule that 70% of the committee are from the local area, is that enough to represent those that use the place as well? It turns out that only a few of our regulars are actually members of the pub. People didn’t feel like the role of the Committee was to represent the members, and – if we’re honest – nobody really understood what the Committee talked about or what we did (or how much of our time it takes as unpaid volunteers). So we’re in the process of introducing a scheme where volunteers and supporters can become members for free and a process by which they can more easily get onto the Committee. We’ve also created a staff liaison role, and are putting up a ‘Bevy Board’ to share minutes of our meetings. We’re finding ways to ensure various parts of the community can attend as observers and commentators at meetings. We understand better now the need to let the management make day-to-day decisions, with the Committee holding them to account on behalf of the members, and how vital it is to maintain an open dialogue. Whilst our regulars are really important to us, we have to include all the other users of the pub too, and even more so those who live in the area but aren’t using it yet. So we’ve decided we need to do even more door knocking to really listen to our local community, something we haven’t systematically done for a little while now. We’ve learnt that of most importance to people is having a palpable sense of power, not just being able to turn up to AGMs and vote people on and off a committee (whose role made no sense to them in the first place) but on more immediate things. What beers to serve, what events to put on, perhaps hold chats about our policies and work on them together rather than decide them on the Committee. We’re not quite sure the best way to do this yet – it’s fair to say we’re working on it. The Board or Management Committee shouldn’t see themselves on some kind of pedestal, looking down – they are but one part of the organisation. You need to work hard on developing trust – using honest and transparent communication, but more importantly two-way conversation that builds relationships between people. It’s about power and the need to distribute it more evenly in ways that are accessible and meaningful. That often starts with some symbolic, immediate and palpable decision-making, however small. The Management Committee only works if it represents the community it serves. We would never have started to notice or understand potential issues without people on the Committee who were close enough to our community raise them. You need to keep revising systems and processes to support your good intentions. Without them they are promises that will drift after the initial surge of enthusiasm. If we’d just had a few chats about membership but not started changing our formal approach, for example, we might have brushed things away in the short-term but in the long-term trust could quickly evaporate. Relationships and needs change over time and the processes you once relied on might not work in a year. We can’t afford to think ‘job done’ so we need to stay open to change and build in mechanisms to constantly review how we’re doing. I do a lot of work with various boards on governance and management – from networks, to small community groups and organisations, to co-operatives, to larger charities and foundations. Although these issues always play out in different ways (not many of those I’ve worked with have spent much time talking about sofas outside a pub!) they are nearly always there and I’d be hard pushed to think of any case where this learning isn’t applicable to any organisation trying to create social change regardless of its size. So, take just a moment and think to yourselves – as the leader in the social sector what’s your own version of the sofa outside the pub story? How might that have an impact on effective governance for your organisation? And how might you respond? This feature was first published in Pioneers Post Quarterly, issue 12. To read the rest of this issue, subscribe here. 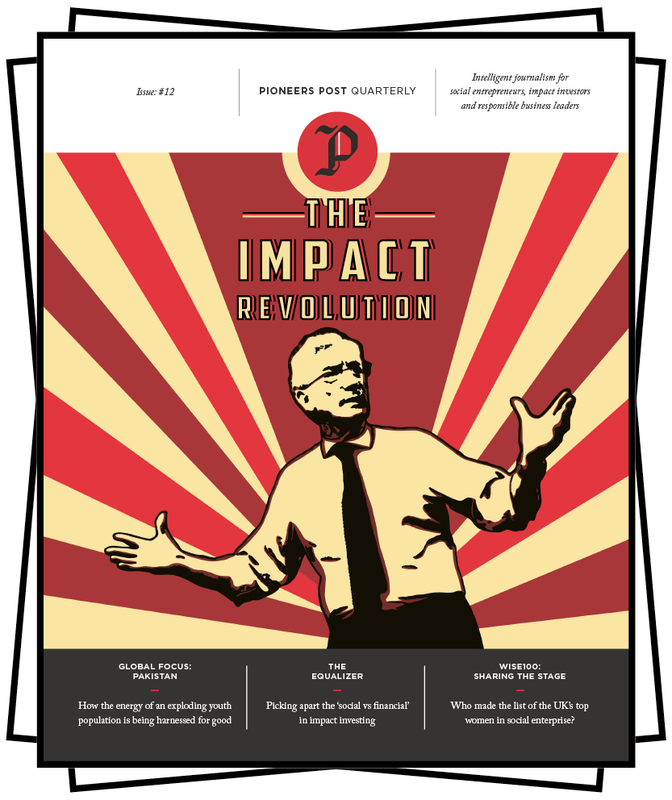 Download the full edition of Pioneers Post Quarterly Issue 12, our first issue of 2019. In the second instalment of his new governance column, Bob Thust asks why those in authority can’t all sit down over dinner and work it out. In the first instalment of his new column for Pioneers Post Quarterly, Bob Thust highlights how governance "can be exciting, liberating, and progressive" - and why it needs to be.